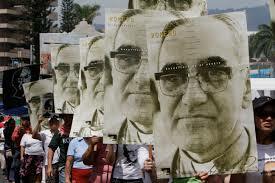 Blessed Óscar Romero: Whom Is This Life For? It means a lot to us to tell people to take care. It shows them and us that we love them. Do you know how many people have told me to be safe while visiting El Salvador? Everyone. I know they do it because they love me and want for my well-being. The reality is that in ways great and small, such remarks unknowingly contribute to a culture of fear that further divides those who are helpless from those with the power to help. This became real for me this week as I witnessed Romero’s beatification coming to fruition. As a privileged, educated, white North American woman who has spent only a few days in this country, I can only speak to how Romero’s beatification has affected me personally. In fact, I have been interviewed by local news sources several times to this effect, being asked, “What does Romero mean to me?” At this point, I can still only repeat the responses I’ve given them, and which were echoed in the closing remarks of today’s beatification mass: Romero’s life, as a voice of truth and love for those who suffer violently to live a dignified life, while singular and unique, is possible for everyone. I often hear it said–and admittedly think to myself–that it takes a special kind of person to be great and “I am not that person.” People think and say such things because they let themselves be ruled by the fear of the consequences of going outside themselves, of thinking too much of themselves and too little of the good they could do for others. Romero’s life shows us it is possible and necessary to love in the face of fear and not to hide in the comfort of privilege, not to take care so much for themselves but for others, especially those whom society prevents from taking care of themselves. There is so much more I want to say but the one question I want to ask you in light of today is this: the next time you catch yourself telling yourself or someone else to “take care” or “stay safe,” ask who is this life for anyway? Reblogged this on fe y compromiso social.